On Sunday morning 2 October, in rounding off a week of national peace and anti-war activities in Alice Springs, 100 people rallied outside the gates of Pine Gap, the US military spy base near Alice Springs singing a new powerful song especially written for the occasion, calling for Australia’s independence from the USA. Significantly it was sung on the weekend of the AFL Grand Final to the tune of “Up there Cazaly”. These fine sentiments really sum up the vision for a different future for Australia and its people. In the last week of September and the first weekend of October several hundred people from around Australia gathered in the central Australian town of Alice Springs to mark the 50th anniversary of the establishment of the nearby US-controlled Pine Gap spy base, and 40 years of campaigning by the Australian people to expose and close down the foreign military base. In today’s world of worsening capitalist economic crisis, military build up and rising international tensions instigated mainly by the US, the threat of major wars in East Europe and the South China Sea is very real. In Australia there are growing concerns and disquiet with the US control of Australia’s foreign and military policies and defence operations. There are deepening concerns with Australia’s main parliamentary parties’ subservience and acquiescence to the US as its deputy sheriff. The integration and interoperability of Australia’s military and defence with the US imperialist war machine is worrying more people, including a growing number of academics and Australia’s military personnel. The complicity and servility of successive Australian governments and the two major parliamentary parties to US imperialism is more widely felt and recognised. Against this background a National Peace and Anti-War Gathering was held in the town of Alice Springs and outside the gates of Pine Gap, one of the most highly secretive and important US military spy bases in the world, 19 kilometres from Alice Springs. More than 30 peace and anti-war groups and community organisations came together from around Australia in a week of diverse and creative activities to throw the spotlight on the operations of the spy base and call on Australia to adopt an independent and peaceful foreign policy and disengage from the US global war machine. Several peaceful protests were held outside the Pine Gap base; leaflets were handed out to the local community; Quaker Grandmothers for Peace blocked the road to Pine Gap; a group of peace activists chained themselves to US multinational Raytheon weapons manufacturer’s gates; and other activities engaging the local community were held throughout the week. Representatives from the local Indigenous traditional custodians, the Arrernte people, spoke several times outside the Pine Gap gates reminding the world that Pine Gap occupies stolen land and there was no consultation or permission sought from the traditional custodians to build the US military spy base on their land. On Friday evening 30 September the Independent and Peaceful Australia Network (IPAN) held a well-attended public information forum in the town, and its annual national conference on the following day. In the months leading up to the 50 year anniversary protest activities there was concerted work done by local townspeople to spread information about Pine Gap. The local campaign and the posters and leaflets on display in shop windows generated a lot of interest in the town and more than 170 people attended the Friday night forum “Pine Gap: Secrets in the Centre”. IPAN is a national network of more than 30 affiliated peace and anti-war organisations, community groups and unions who support an independent and peaceful Australian foreign policy, oppose US military bases on Australian soil and the stationing of US marines in Darwin. IPAN is a growing national network with expanding and strengthening links with similar anti-foreign bases groups in the Asia-Pacific region. Professor Richard Tanter from the Nautilus Institute of Melbourne University gave a detailed presentation which explained the various functions of Pine Gap in its service to the strategic and military interests of US imperialism. He revealed how the base has enhanced its role from military communications and intelligence gathering into missile and drone targeting and space warfare capabilities. Although nominally a “joint defence facility”, Professor Tanter saw the role of the Australian personnel at the base as very much secondary to the controlling role of the US. This was exercised by the US military through the US National Reconnaissance Office and the Central Intelligence Agency, with much of the detailed work now being conducted by the US weapons manufacturers Raytheon Corporation, Lockheed Martin and other big private contractors. The Australians allegedly get access to the information collected, but not to the US coded messages sent back to the Pentagon! Some of these messages contain coordinates for targeting drone attacks and assassinations of US ‘enemies’ in countries such as Afghanistan, Pakistan, Somalia and Yemen. These extrajudicial killings are frequently accompanied by ‘collateral damage’ inflicted on innocent civilians and families of the targeted people. There are no formal charges, arrests or trials – just the word of US imperialism that this is all necessary to defeat ‘terrorism’. Our subservient governments, past and present, by their silence have made Australia complicit in these war crimes against humanity. Both Lisa Natividad and Kosuzu Abe told the public forum that the presence of US bases and stationing tens of thousands of troops in Okinawa and Guam is a form of colonialism. They stressed the importance of expressions of international solidarity and how much this gave encouragement to their people in struggle. The final speaker at the forum was Senator Scott Ludlam from the Australian Greens. He reflected on the recent history of both Labor and Coalition governments, keen to outdo each other in proving themselves as the best ‘US deputy sheriff’ by pandering to the strategic agenda of the US military and its corporate arms manufacturers. There was also a different history – of protests and opposition to Pine Gap and the other US military bases – North West Cape, Nurrungar and now Darwin, which is hosting a permanent stockpile of US Marines, warplanes, tanks and military equipment. Pine Gap has always been recognised as the most important and critical base for US global war planning and for this reason has attracted the most opposition. Not only does the existence and function of Pine Gap trample all over Australian independence and sovreignty, it is almost certainly a nuclear target in any war between the USA and either China or Russia. Senator Ludlam could see no benefit to the Australian people from the Pine Gap base, but plenty of danger as the threat of war was increasing over the South China Sea and the US military ‘pivot’ to tighten the encirclement of China. The closure and removal of Pine Gap was the only sensible option. The public forum concluded with the panel of speakers responding to audience questions and continued with many lively discussions into the evening. The next day Saturday 1st October 140 national delegates and members of local community came together for the IPAN National Conference, Pine Gap: Serving US militarism for 50 years - Time for Independence. Messages of solidarity and support were received from New Zealand, Canada and the Philippines. Videos of solidarity messages were exchanged between IPAN National Conference and the International Global Campaign on Military Spending Congress being held in Berlin on the same weekend. An IPAN representative was attending the International Congress and spoke at two of its sessions. “Since European colonisation, significant parts of Australia’s defence budget and public spending have been exclusively servicing British and US global military agendas and their foreign wars. Today, the Australian government purchases most of the weaponry designed for offensive warfare from multinational arms manufacturers who stand to profit enormously from a world that’s in a perpetual state of conflict, mass slaughter, and preparations for more wars. “Another cost of US-Australia alliance and its even deeper integration and inoperability into US military is the destruction of Australia’s “defence” manufacturing industries. Australia’s “defence” industries are now being increasingly forced to import more expensive offensive hardware from mainly US multinational arms corporations. This imported weaponry is designed for offensive aggression and of which Australia has no need for the defence of our sovereignty, but is increasing the “defence” budget and destroying hundreds of jobs and livelihood for hundreds of workers in Australia. 2. Establish independent working relationships with countries, especially in our region, based on mutual respect, equality and national sovereignty. Promote peaceful resolutions of conflict between countries through negotiations and diplomacy, see IPAN’s Statement on the South China Sea Territorial Dispute. 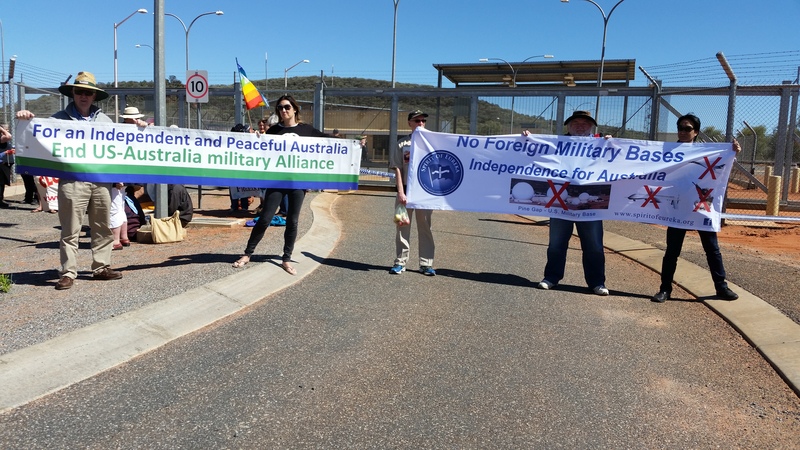 During the week of activities in Alice Springs and outside Pine Gap two permanent Peace campsites were established on the side of the road outside the Pine Gap base, from where several protest actions were launched, plus a successful exposure of the secretive and unmarked US multinational weapons manufacturer Raytheon office in the township. Early in the morning several protesters chained themselves to the gates, preventing staff from entering and highlighting the key role this murderous company has in the operations of Pine Gap. What emerged from the conference was a clear consensus to close Pine Gap and expel US Marines from Darwin. Many delegates felt that this would only happen when the US Alliance was rejected and the ANZUS Treaty discarded. Unfortunately the crowded agenda left little time to debate much of this and other important issues raised by delegates, but nevertheless the conference ended on a positive and united note. In the evening, a candlelight procession from Anzac Hill was followed by a shared meal next to the Todd River. On the Sunday morning more than 30 cars assembled with banners and balloons, and set off in convoy to the gates of the Pine Gap base for another protest rally with speeches and demands to close Pine Gap. This was a repeat of the Picnic at Pine Gap held at the first Pine Gap protest in 1976. The road to Pine Gap was blocked off to cars two hundred metres from the gates of the base. Protestors were frisked by Northern Territory police before we were allowed to walk through the road block to the gates, where 30 Federal police were guarding US military and spy installation. The protestors were extensively photographed by a US agent with a long lens camera. 2. The illegal drone assassination program perpetrated by the United States with the assistance of Pine Gap makes the Australian people complicit in this illegal activity. For these reasons, IPAN, on behalf of all concerned people of Australia, calls for the immediate cessation of this illegal drone program and the termination of the Pine Gap facilities as soon as possible. Australia will then be a safer place for all of us.